This important clock was made by Valadier for Principe Don Abbondio Rezzonico, Senator of Rome (1741 - 1810) and bears his coat of arms. 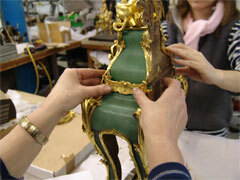 It was originally brought to us for cleaning of the gilt bronze decorative mounts. 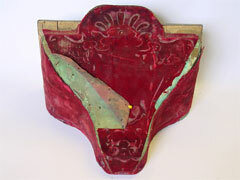 When the mounts were removed, the crimson velvet covering to the wooden case was found to be detached and slightly damaged in some areas. 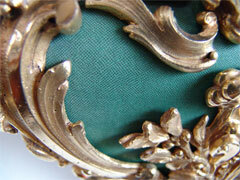 Beneath the velvet appeared the original covering to the wooden case - fine, blue-green shagreen. The client's research showed that Valladier's inventory recorded object No.570 as a clock "di zegrino verde con rapporti di metallo dorato". Though extremely rare, both crimson velvet coverings and shagreen are known for this period. A small sample of the velvet was tested by a textile conservator to try to establish the date at which this was applied to the clock case, but the results were inconclusive. 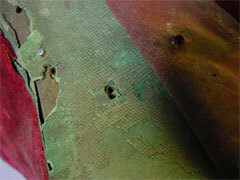 It was clear however that the shagreen covering was the original, and that its appearance had deteriorated considerably. 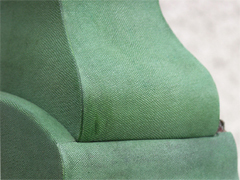 A decision was made to replace the original shagreen covering, thus restoring the object to the creator's original intention. Shagreen, which is polished shark or ray skin, is still produced to decorate the surface of small objects. The skins of non-endangered fish are used today. The preparation, smoothing, dyeing and finishing of the skin is a rare skill. 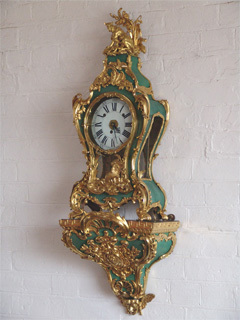 After a lengthy search we located a specialist in France who re-covered the clock case with a matching shagreen of an immaculate finish, dyed to a blue-green to match the original colour. 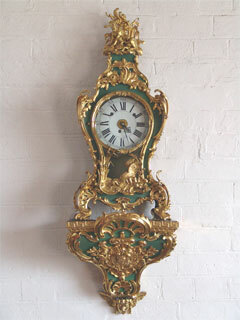 The gilt bronze mounts, having been carefully cleaned in the studio, were then reattached to the clock case. Some inappropriate fixings were replaced with more delicate, gilded fixings, where required. Luigi Valadier was a major goldsmith, working in Rome in the third quarter of the 18th century.